There has been much said, done and written about the terror of "Berserk Male Syndrome" or "Aberrant Behavior Syndrome" in llama circles. Yet no clear definition of either "syndrome", which should be a collection of symptoms, seems to exist in veterinary texts or llama care books. This would understandably be confusing to the person new to llamas, the veterinarian new to llamas, and even intimidating to experienced llama owners. Perhaps we should not be so concerned with the fact that llamas do indeed sometimes exhibit dangerous behaviors, but more amazed by the fact that there is only one documented case of a human being being killed, albeit indirectly, by a llama. People are killed by horses every year, and by dogs several times a year. Hand raised male deer are listed as "dangerous animals" in wildlife rehab texts and human deaths are not unheard of from these animals. I have been researching, to the best of my ability, the extent of dangerous and aggressive behavior in llamas for 5 years, and have been unable to find a single documented case of a human being killed by an attack by a llama. I have been unable to find a llama that with gelding and training I could not place in a good home, despite offering a nationwide $500 reward for a "berserk" llama. So, in light of the previous, I would like to try and offer descriptions of several syndromes, as described by the observable behaviors, and appropriate actions that owners might consider and veterinarians might recommend. I hope only that these syndromes might be helpful to all involved with llamas, perhaps spare human injuries, and perhaps save the lives of some animals who are mistakenly thought to be "incurably berserk". Although untrained llamas can cause injury to people, there are many excellent training videos, books and clinics available which may effectively solve the problems. 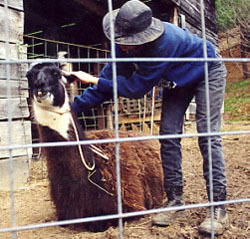 Also, many times, local llama breeders and trainers are willing to give advice and help. At a potentially more concerning level of aggression we might describe the llama showing early symptoms of a more serious problem. This would not be an animal that was simply untrained or mildly mishandled, or yet dangerous. This llama would most likely have some kind of history that would indicate further potential danger which has not yet erupted. Although these animals have not yet injured anyone, or even necessarily caused any discomfort for the owner, as they sexually mature the probability that they might misbehave causes concern based on lay experience and the recent survey research conducted by Ohio State University. 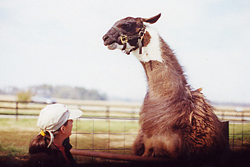 The instant that these animals mature to the point at which they attempt to assert their already tested dominance, they often frighten both new and experienced llama breeders, and are thought to be incurably "berserk" and euthanized. In our experience, these animals are easily trained after gelding, which seems to be the single most effective intervention, and is often by itself the only one necessary. We do not have enough data at this point to say definitively that these llamas should be gelded or referred to professional trainers at a certain age. However, we can say anecdotally that gelding at 12-18 months seems to be an appropriate recommendation, although gelding at any age seems to be the single most important intervention that can be made. Consultation with a trainer experienced in aggression is always recommended. Many trainers interested in aggression consult free of charge. Contact us. Usually this results in minor or major human injuries (although no deaths from this type of behavior have ever been documented). Although these animals are undeniably dangerous and a liability to owners in most states, they are by no means, in our experience, incurable. Generally gelding and basic training are 100% effective if carried out by someone experienced in aggression in herd animals. Although owners may choose to euthanize the animal, due to practical reasons, some rehabbers will take such animals and free the owner of any liability. Some will even arrange transport at no cost to the owner. This may be a recommendation worth considering to some owners. Of course, restraint of the animal which ensures basic care and the safety of human caretakers must be of the utmost priority until conditions can be arranged. Finally, we have the "berserk" llama. This animal is most likely affected with a brain tumor, and will not recover. We have one anecdotal case of such an animal, confirmed upon necropsy, and acknowledge that an incurable case of aggression in llamas does exist and most likely will again. We hope, in continuing our own "backyard" research, to someday provide people with the means to guess at the difference between an "over-handled" llama, and a llama with a brain tumor. We will proceed faster if we have more animals to study, and we will try to the best of our ability to accomplish this at no cost to the owner. While it may be impractical or even dangerous for some owners to send their animals to SELR or other research facilities, we do hope that some effort can be made to offer safe options to owners who do not necessarily wish to euthanize animals they are having difficulty with. We hope you'll contact us if you have such a llama.